RiscaGame wrote: Dragons would be stupid to sign Young. Half our problem this season is we have spent a 10% chunk of our budget on Moriarty. We need to spend our budget elsewhere, like ten or a big lump of a lock. Forwards: Rob Evans, Ken Owens, Tomas Francis, Alun Wyn Jones, Adam Beard, Josh Navidi, Justin Tipuric, Ross Moriarty, Elliot Dee, Wyn Jones, Samson Lee, Cory Hill, Aaron Wainwright, Dillon Lewis, Ryan Elias, Nicky Smith, Jake Ball, Thomas Young. Backs: Liam Williams, George North, Jonathan Davies, Hadleigh Parkes, Josh Adams, Gareth Anscombe, Tomos Williams, Gareth Davies, Dan Biggar, Owen Watkin, Aled Davies, Hallam Amos, Jonah Holmes. BBC wrote: Wales flanker Thomas Young could stake a claim for a World Cup squad place if he impresses against Italy, according to forwards coach Robin McBryde. Wasps' Young, 26, won his two caps when McBryde was in charge of Wales' Tests against Samoa and Tonga in 2017. But he could feature in Rome on Saturday, with Wales expected to make changes from Friday's Six Nations opening win in France. "He thoroughly deserves his opportunity," said McBryde. "He's been a consistent player. His selection was based on that two years ago. He is a consistent performer for Wasps every week. "He's playing in a league where there are big men week in, week out and the intensity is there. "He's had several man-of-the-match awards. "In defence he makes intelligent decisions of when to compete for the ball and in attack he links up with the backs. He is doing that here as well." Young is part of a 31-man Wales squad in Nice for a training camp in between their first two Six Nations matches of the year. The open-side has earned glowing reviews for his performances for Wasps in the English Premiership in recent years. But he has found opportunities limited with Wales, whose wealth of back-row options includes Justin Tipuric, Josh Navidi, Ellis Jenkins, Aaron Shingler and James Davies. However, injuries to Jenkins, Shingler and Davies opened the door for Young's inclusion in the initial extended 39-man squad Wales named for the Six Nations. And with Tipuric, Navidi, Aaron Wainwright and Ross Moriarty the only other specialist back-rowers in the 31-strong party in Nice, Young is in contention for a rare start in Rome. "We've got several to choose from. We're testing that strength in depth," said McBryde. "But we only have five back-rowers in the squad. It will be the same at the World Cup, an 18-13 split, four second-rowers, five back-rowers. "It's an opportunity for anyone down here to stake a claim and make a name for themselves. If anyone gets the opportunity, they have to take it. "[The 2017 Tests against Samoa and Tonga] were a snapshot of a tour, there was a lack of time and preparations. During the Six Nations you have a chance to look at someone properly. "The fact he [Young] has had the first couple of weeks with us and been able to bed in, he has benefitted from that." Sounds like Tommy Yoongs could get a run. I’d be happy with that. Just one or two changes around the experienced spine of the mainly first team. Perhaps Owen Watkin too. I don’t rate Moriarty at an 8, his control at the back of the scrum isn’t good enough. I think someone else would be better off having TY. Do you think Ollie will be developed as an eight. I know he has played there a number of times but I thought he was being lined up to be your seven...? Adding depth to any regional squad is going to benefit that region, if they can afford TYs wages. Or if he accepts the new pay scale. Might have to take a pay cut to get more caps...? Owen Williams could be in the same boat if he returns. Yeah he’s a 7 that can play 8; a few teams including ourselves play with two 7s. I imagine he will be a 7 that continues to also cover the back-row, like Navidi. Anyone else think Lewis could bump Lee outta the team? All Lee had going for him was being strong in the scrum but this season he mostly goes backwards. There are mutterings in the Wales online arrive this evening that JD2 will skipper and AWJ will be on the bench. Possible changes with new players coming in for Italy. AWJ and Owens probably won’t be in the starting team then. BBC were running a similar story. They didn’t mention Owens but if JD2 is captain then I would assume that Owens is also benched or not in the 23. BBC dubbed it as going to be a ‘much-changed’ team but I’d probably go a bit easy on the changes myself. Absolute madness to make wholesale changes. We need to be targeting a bonus point win. Italy always have at least one good game in them each 6N's. If we go out there without 1st teamers then we will come a cropper. Obviously Tipuric to be rested. AWJ too - RWC year, old man legs. Makes sense, even if it's a bench place. Rotation across the front row might be a possibility, and whilst I'd like to see Watkin come in, I can't see it. Surely Steff Evans has a place but then who do you drop in the back 3? If he's consistent he might drop Adams, which seems harsh but he's done enough to start against England with his performances over the last 12 months. No harm in giving Steff a go to acclimatise at test level which hasn't really happened yet. Wainwright probably deserves a look - maybe Moriarty to the bench? Navidi at 8 to start. That already feels like too many changes though. Gatland's never really rotated in the 6Ns like he does in the AIs - not after 2009 in Italy. So pick half of those and that's probably the team. I think if Wales gout with out there first team players it shows disrespect to Italy. And it may just come back to bite them in the back side. Like LordDowlais says Italy a;ways have one good game in them, and this could be that game. majesticimperialman wrote: I think if Wales gout with out there first team players it shows disrespect to Italy. Wales have gone to Italy without a first team for years. I’m the last five years they have put 200 points on Italy. There is no disrespect, this is no different to when any other team including England, goes to a weaker nation. Wales picked a “b” team against Tonga in the Autumn, no disrespect shown there either. Being within 15 points of Scotland at Murrayfield and scoring three tries is a good game for Italy. I am sure they put as much effort into every fixture in the six nations. It won’t be too long before they start to get more competitive. Seems like mass changes it is then. Kind of makes Gatland’s pre championship talk of winning the thing pointless, when points difference or bonus points could be important. I don’t think it’s disrespectful to Italy (though that’s up to them to prove otherwise), but I would’ve liked us to try and do a job and then bring on certain players. maestegmafia wrote: Wales picked a “b” team against Tonga in the Autumn, no disrespect shown there either. Wales were at home, against a much poorer Tongan side than what we will come up against, in an Italian side at home, infront of thier own supporters in Italy. maestegmafia wrote: Being within 15 points of Scotland at Murrayfield and scoring three tries is a good game for Italy. I am sure they put as much effort into every fixture in the six nations. Italy finished stronger, because the 15 they had left on the field, were better than the 15 Scotland had left on the field. We've been here too many times, when will we learn, you send a second string side to Italy, it will cost you. I see nothing but an extremely long day for the Italians. The fightback that Wales produced against France was something special and I feel they will kick on in this tournament. Its fast becoming a 2 horse race between Wales and England for me. I don’t think Gatland making changes to the team weakens it as massively as some of you are making out. We have improved the strength and quality of our over all squad and this showed in the summer and autumn tours. Yes consistency is a factor but so is squad rotation and giving experience to those who need it. Picking Tom Young at openside may be a revaluation, he is one hell of a player. Bringing in Jake Ball to the second row may give us forward momentum. Dillon Lewis and Elliot Dee may give us a more dynamic front row than we played against France, where countering their larger pack at set piece was a concern. I understand rotation but I simply do not believe the players need a rest a this stage of the tournament. They probably didn't play for 2 weeks before the France game and will have two weeks off after the Italy game. So for some 'rested' players it will be 1 game in a month when England come to Cardiff! There's a fine line between being fresh and rested and bring rusty and match not fit. I hope Gats know what he's doing. Not sure about that Maes. This was the team the last time we went to Italy in the 6N. Struggled for an hour and didn't get a bonus point. Strong team. 2013! Apart from the 2nd rows that was probably first choice at the time. a 9-26 win. Wales: Halfpenny, Cuthbert, Davies, Roberts, North, Biggar, Phillips, Jenkins, Hibbard, A Jones, Coombs, Evans, R. Jones, Tipuric, Faletau. I stand corrected. Nice digging. Sorry! Not trying to prove a point. Was just interested so wanted to read the match reports to see how we had done! The Oracle wrote: Sorry! Not trying to prove a point. Was just interested so wanted to read the match reports to see how we had done! Must be the games we played in Cardiff where we didn’t take the 1st xv? I think we all agree that we have strength in the larger squad. My point being that do we really lose much clout on the pitch by swapping a few players around. Might change style a bit as we add and subtract different skill sets but Rob Evans for Nicky Smith or even Wyn Jones doesn’t alter our ability much at all. Likewise; Navidi for TY, Watkins for Parkes, Ball for Beard, Dee for Owens or Amos for Williams..? One thing we do need to do is play a competitive match without AWJ in the 23. Should there be an injury at the RWC we need to know we still function well without him. What ever team we play in Rome, they have to get a winning BP and put a big points diff on the game. Lets not forget, this could be the championship decider, as I can see beating England but slipping up to Ireland. If that happens and its a 1 loss for us all, its going to come down to BP and then Points Diff.. So everyone's game against Italy is going to count. As ungracious as its sounds, saying Italy are the whipping boys, unfortunately at the moment, its correct. If England, Ireland and Wales lose just one game each, their games against Italy are likely to be the difference between lifting the trophy or not. With the way their province teams are improving and their under 20s are again excelling it hopefully won’t take long to get them up being competitive in all games. It wasn’t until 1954 that France really announced themselves on the international scene by drawing the five nations and beating the ABs. England's bonus point against Ireland has pretty much put paid to Wales, or anyone else, winninng the tournament through points difference and bonus points. Unless England lose twice, I think someone has to with the GS to win the title. No-one else is going to score 4 against Ireland - England could easily score 4 against Scotland and France, should against Italy, and probably won't against Wales. I think Wales would struggle to match that. Wales missing the 4th try against France, when I really believe it was there for the taking in the last 10 minutes, was important. Yes I remember that! An unfortunate 14 point swing late on. And Orquera landing the offload from the touchline when he usually couldn't hit a barn door. Great final weekend that. Was that the crazy super Saturday with the 3 games needing high scores? If so, that was perhaps the best round of the 6N ever. Pure theatre. Loved it, even though we ended up missing out on the trophy. It was last season where we payed Italy with a much-changed team (at home) and achieved the bonus point win - I expect the same this year. I think it’s Gatland’s plan to win the tournament by remaining unbeaten, not easy given who we’re playing but he’s obviously confident. Italy are a given 5 points for all the others and I expect England will continue to rack up a few points themsleves if they continue from where they left off in round 1, so we’ll only win this tournament by getting a grand slam. I’m not sure why people dig up results which were the fault of the Howler, they should be considered an anomaly. That guy is the worst coach in the world. The Oracle wrote: Was that the crazy super Saturday with the 3 games needing high scores? If so, that was perhaps the best round of the 6N ever. Pure theatre. Loved it, even though we ended up missing out on the trophy. Yeah pretty good weekend. The best part was showing the Scots how to beat Italy. Team to be announced at 10 O’clock this morning...! My thoughts are that Gatland will keep a core of the players from last week and change some on the periphery. Wales Online wrote: Aled Davies will start at scrum-half for Wales against Italy on Saturday. 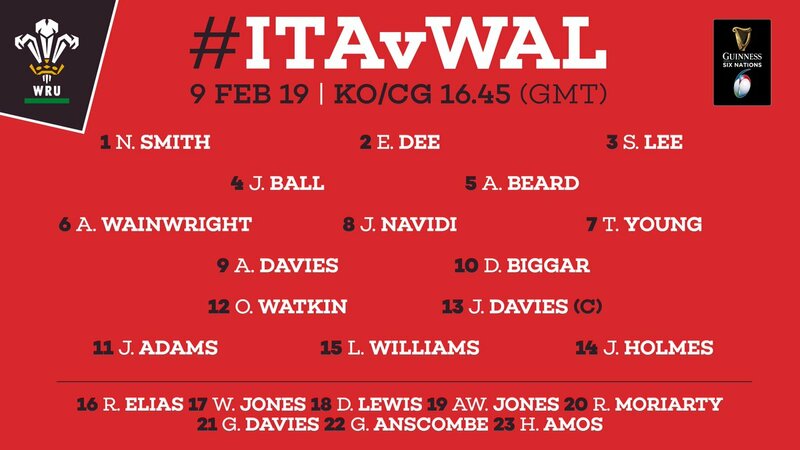 Elsewhere, Wales have opted for a new-look and inexperienced back row as Thomas Young and Aaron Wainwright make their Six Nations debuts alongside Josh Navidi, who starts at number eight. It means Ross Moriarty is rested along with Alun Wyn Jones, with Cory Hill coming into the side in the second row. Team announcement due in a smidge over an hour. I make that 9 changes from the starting XV against France. I’m happy with that team, looks exciting. Hope to see some great attacking rugby. Great opportunities for a number of players to press for first team places. It's quite something that a team with that many changes doesn't look all that much weaker (on paper). Go back a few years and 9 changes would mean a real drop in quality. Luckless Pedestrian wrote: It's quite something that a team with that many changes doesn't look all that much weaker (on paper). Go back a few years and 9 changes would mean a real drop in quality. I did think that. Would've liked to have seen Hill involved again, seeing as he was "only" a replacement last weekend. Wales will win but I can't help but think they are disrespecting them a little bit seeing as its only the 2nd game. At home I could understand it but in Rome, Italy thrive on momentum, by the time Gatland unloads the bench the game might be already gone. Italy's team talk and motivation is already sorted. TightHEAD wrote: Wales will win but I can't help but think they are disrespecting them a little bit seeing as its only the 2nd game. At home I could understand it but in Rome, Italy thrive on momentum, by the time Gatland unloads the bench the game might be already gone. We will have to wait and see, Italy may well make ten changes too..!